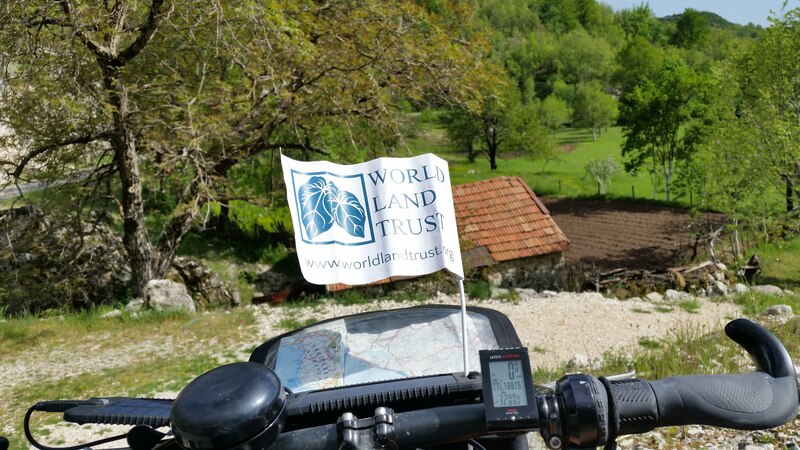 We knew very little about Montenegro before this trip, and certainly hadn’t heard of it as being a cycling destination, but it is a cyclist’s dream and is bound to get more popular in the coming years. There are many new roads that have been built leaving the old country roads empty except for local traffic. 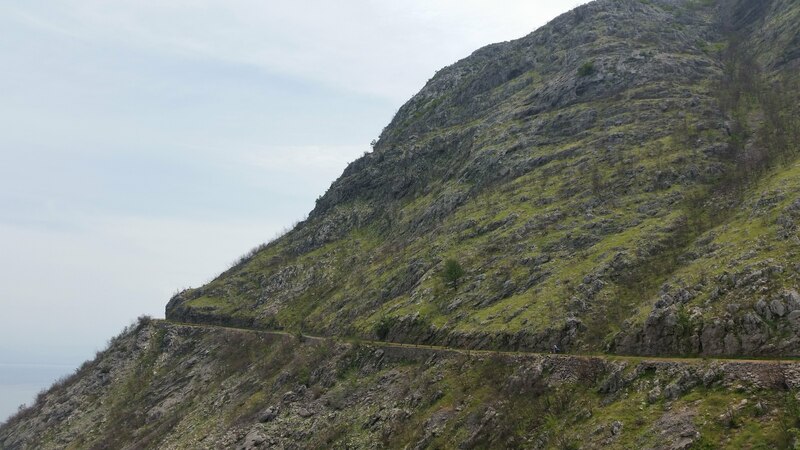 These old roads twist up, down and around limestone cliffs and mountains through small villages and with stunning views. From the Bosnian border we dropped down into Grahovo, a very small town with the largest and most poignant WW1 war memorial I have ever seen. Passing our 2000 mile mark in 35 degree heat we reflected on our journey so far. So much has changed: landscape, languages, cultures, weather, road conditions, routine (we now get up at 5:30 and cycle early to beat the heat, then take longer lunch breaks) yet we now very much feel in the flow of things. We can read the landscapes to find the perfect wild camp in the dying light, we can tell which towns on the map are likley to have water, we know our abilities and how far we can cycle before needing to stop, but most importantly we have learnt that despite our better knowledge things can still go wrong and when they do, be patient, accept and move on the best you can. Reaching 2000 miles / 3200 kms we pause to reflect on how far we’ve come, and how far we’ve yet to go. 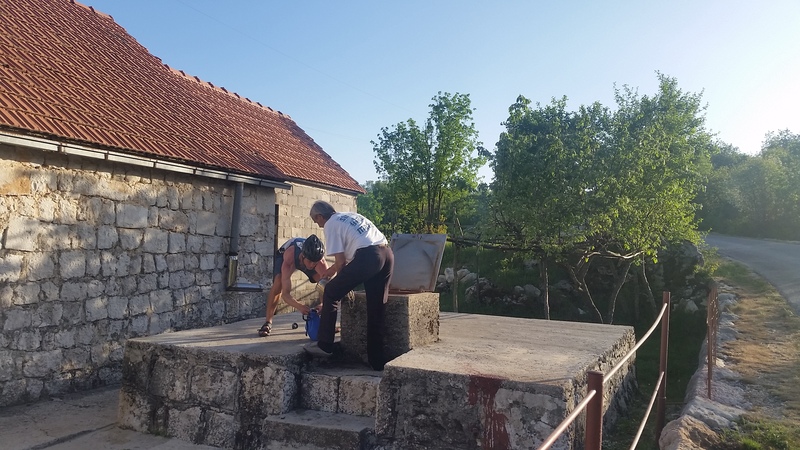 Cycling in the Montenegro hills we’d seen plenty of mountain springs, however the section between Grahovo and Vuci Do was dry and were starting to strategise a dry supper plan when finally we passed a shepherd on the side of the road. Tapping our water bottles and using sign language we asked how far until water. The shepherd started on a long spiel about who knows what but using his arms in a sort of digging motion Jules figued there must be a well close by. Seven, the shepherd marked out on his hands. So 7km later just past Resne which we were sure would have a well we met another old man, who showed us to the next village’s well. First time we’ve used a well for water and now that we were able to recognise them you could see wells all over the mountain, often with buckets tied next to them. It’s still best to try and find a local to ask if the water’s ok to drink as many looked dry or not used often. Winding up and down our small mountain road suddenly popped out near the top of a major new road which goes from Cetinje to Kotor. 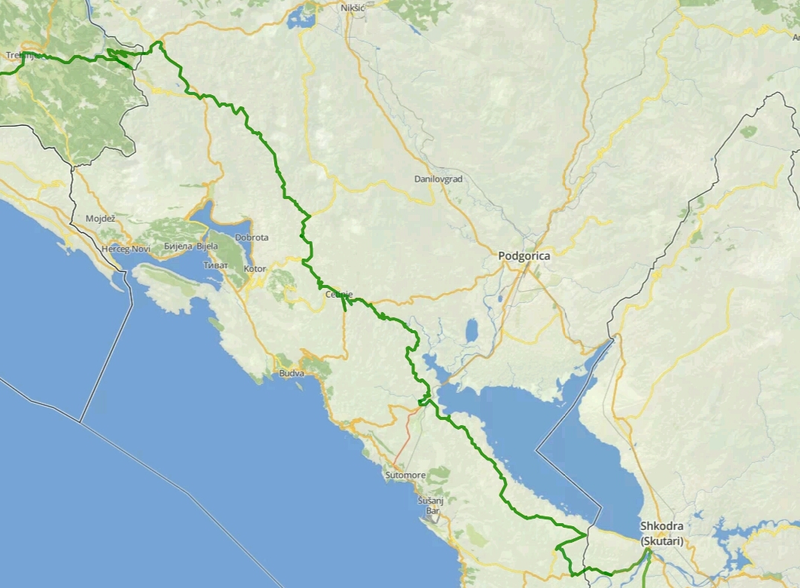 It was a great fast descent down to Cetijne, the wide open quiet road making a nice change from steep tight corners. Cetijne is Montenegro’s old royal capital and a very beautiful small city. It was a good place to stock up on food, relax in the shade and chat to a group of local road cyclists out for a weekend ride. To our surprise we discovered that despite not being in the EU, the currency in Montenegro is Euros. This is because they have no currency of their own and adopted the German Deutcshe Mark in 1996. When Germany became part of the EU, Montenegro negotiated use of their currency. A fairly disastrous decison for many people as prices have risen since then. 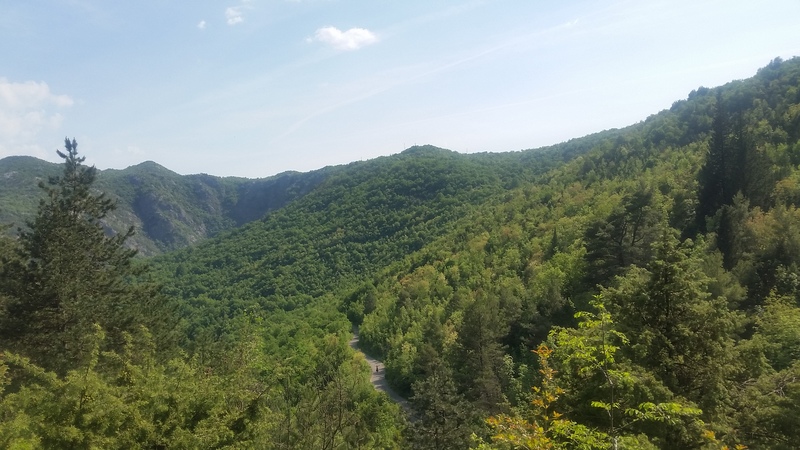 The small road we decided to take from Cetinje to Rijeka Crnojevica was certainly quiet but in very poor condition so it was a hot and hard descent with our ODOs displaying 49 degrees!!! Climbing out of Rijeka Crnojevica through the forest and into Skadar Lake National Park was just magical with incredible views over the lake. The lake is around 400km2 and at only 5m above sea level you could easily be fooled that you are looking out to sea. 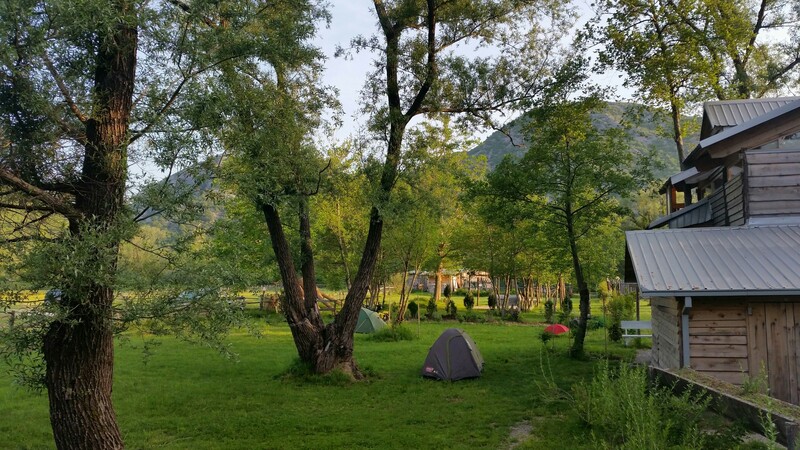 We stayed an idyllic 2 nights at OK Koral campsite near Virpazar before continuing south east towards the Albanian border. Finally a smooth road down - spot Jules! 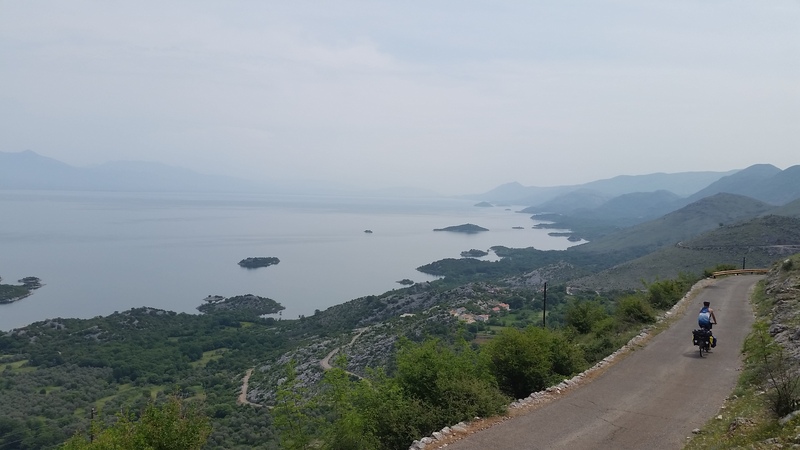 It was another incredible mountain road with plenty to see, the lake, tortoises, snakes, and even a few other cycle tourers. The local environment changed as we moved closer to the border, with women in much more traditional long flowery skirts, small farms and mosques. We were both sad to leave Montenegro and will defintely be back to explore again.